If you doggie has diarrhea or digestive issues, you may want to stop by the Hydrant for some Slippery Elm or Flora4. Slippery elm is the ideal herb for treating dogs with a nervous stomach. While it soothes and protects the digestive tract, it is astringent and can reduce inflammation at the same time. Therefore, it can be used in cases of diarrhea, colitis, stomach ulcers, and so on. The mucilage also lubricates the digestive tract to help in the elimination of waste. While slippery elm benefits dogs suffering from diarrhea, this herb also helps constipated dogs. In cases of constipation, this herb helps and relaxes the muscles to facilitate elimination of waste. To aid digestion when transitioning to a new food. 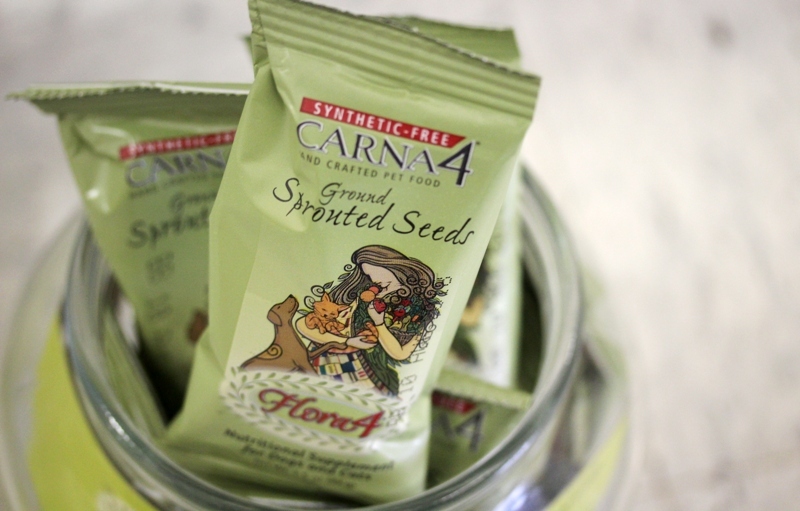 Carna4’s Flora4 Ground Sprouted Seeds Food Topper simplifies the chore of learning how to supplement effectively to add the live probiotics, plant enzymes, phytonutrients and whole food vitamins & minerals that are lacking in an all-meat diet. Flora4 contains only 100% raw organic sprouted seeds (a blend of barley seed, flaxseed, and lentils), ground into a fine powder. You can add Flora4 to every meal to supply all your dog’s non-meat nutritional requirements. Or if you already mix foods like tripe, green leafy & root vegetables into your dog’s raw diet, try using Flora4 every couple of days to “fill in the gaps”. That way, you can be sure that you’re not missing any essential vitamins & minerals with your homemade recipes. Your cat can also benefit from the intense nutrition in Flora4. Be sure to add healthy sources of taurine such as organ meat – pork liver and duck liver are 2 excellent examples. Flora4 is extremely versatile. It can be sprinkled into raw, home-cooked food or commercial kibble to boost nutrition and complete the diet. If your main pet food contains vitamin/mineral additives (kibbles and canned foods), then you should consider supplementing the diet with doses of Flora4 every day or two, to make sure your pet is getting really bio-available nutrients from food – not just synthetics. Our testing has shown that dogs and cats love the mix of flavors from meat + our sprouted seed blend. Flora4 gives Raw feeders the convenient whole food supplement they’ve been waiting for — no need to use bottled synthetic products again!